This story is still spinning through my mind. This book is shocking and beautiful. It is mind-bending and eye-opening. Max knows that he is intersex. It hasn't been much of an issue for him, mostly because his parents have kept him from knowing the full details. After an appalling assault Max is forced to face his "disorder". Who is he? What is he? Will he live his life alone? Who can he trust? These are questions that most teenagers ask themselves. But for Max they have more urgency. The decisions he makes now will have long lasting consequences. Golden Boy is told from multiple points of view. Each narrator offers a fresh perspective. I especially enjoyed hearing from Daniel, Max's little brother. His voice is humorous and innocent. This is a heavy read and hearing from Daniel gave the story some much needed levity. Timely and important, Golden Boy is a must-read. I'm looking forward to whatever Abigail Tarttelin sets her mind to next. 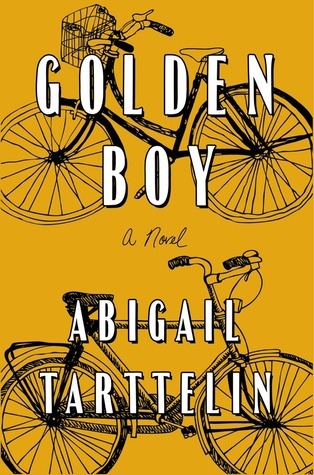 Abigail Tarttelin is a novelist, actress, and Books Editor for Phoenix Magazine. In her spare time she reviews books for the Huffington Post and blogs about her adventures on Youtube. Intersex???? What exactly is intersex? Andddddd if you liked that book, Annabel is a good one about a male/female whose parents choose his way until he's old enough to choose on his own. I looked up Annabel and it sounds great! (That character was also intersex, so you do know what that is!) Intersex people used to be called hermaphrodites but that's not a term that is used much now, at least to my knowledge. Finally, someone who has read Annabel! I've seen it on tons of lists, but hadn't actually talked to someone who read it and was curious if it was really any good. So glad you enjoyed Golden Boy, Jennifer! You're right, Danial gives some much needed levity to the book. If found the dynamics between the parents interesting and heart breaking. Glad you liked it. Ah yes, those parents. One moment I wanted to hug them. The next I wanted to slap them. Great characters! I used to not like novels told from multiple points of view but must say they are growing on me. They used to seem contrived but now I'm curious about how differently people can see a situation. I like it, sometimes. It worked very well in this book! Especially since the points of view are so different and each had their own definite voice. Initially, the cover attracted me to this book, and, until now, I really didn't know what it was about. But the idea of a coming-of-age story presented as a fascinating gender identity study sounds wonderfully complex. Just another book to add to the never ending TBR! Wow. I'm wondering how I missed this one. It sounds fantastic and the type of edgy that I love. Great review! I first heard about it from Shannon @ River City Reading and I'm SO glad that I did! I read this a while ago and it is still with me. Incredible book. Hmmm..I might have actually heard about this first from you? It was either you or Shannon, lol. Great book though, I think it will be sticking with me for a long while as well. Oh, that sounds really interesting! I'm glad you enjoyed it, and now I have to add it to my reading pile! It's endlessly fascinating! I hope you find time for it and like it as much as I did! Ah yes, I do know what you mean. I would probably have hesitated as well if I hadn't read Middlesex so long ago. Actually, I should re-read that one! This one has caught my interest from the moment I read the synopsis and did more research on intersex. Will request at my library. Thanks for the review! I hope you are able to get your hands on it soon Laura! It can be tough to read but oh so worth it! I haven't heard of this book at all! I definitely need to check it out. I was about to ask if you had read Middlesex but see you mentioned it above. That book was incredible. I would like to reread Middlesex. I think I even have it around here somewhere. Hmmm. I need a much better system for my books, lol. Sounds right up my alley! Glad that it's good and you enjoyed it. Hey! I actually spoke to the author during a Q&A on Goodreads. Lucky duck :) She must have quite a head on her shoulders to write something like this. She's quite a young lass too which is awesome! This sounds good, and quite important, too. Good to read your reply to Rebecca, I was thinking it was that condition but the newer phrase is new to me. Important is a great word for this book! Thanks for this review, Jennifer. I thought Middlesex by Jeffrey Eugenides was excellent and it sounds like this one is similar. You bet Melissa :) I hope you find time in your reading schedule for this book! Wow. This sounds like an amazing book. I recently read a series of articles about intersex individuals and how that affects my particular religious tradition. It's a fascinating subject and one that I hope will see more acceptance. I will definitely be checking this book out. It's really something Jessica, great read :) Acceptance, yes! I do hope you read this, it's really unforgettable. This sounds fascinating. I think we need to read books like this to increase understanding and acceptance of intersex people. And the cover art is beautiful! Have you read Middlesex? It seems like a similar concept, except the protagonist doesn't grow up knowing about his anatomical differences. As I was reading I wanted to DO SOMETHING. There must be so many confused and struggling intersex people in the world. I can't imagine what it must be like. I wanted to gather them all in my home and feed them dinner or something, lol. Is that weird? Probably. Fascinating review for what sounds like a fascinating book! Thanks for bringing something new and different to the table in so many respects, Jennifer. I thought this book was great as well. I loved that the author presented various perspectives as for me it really added depth. I found myself at times completely understanding the mother's perspective and at other times was completely angry with her. I do hope this is a book that gets a lot of visibility. Yes! There were times when I wanted to shake that woman. Then, reading from her perspective you could see that she really was trying to do the best she could. I hope this book reaches a wide audience as well. It should. I'll be honest, the cover art for this one initially turned me off (I know, judgy). But your review is awesome. I NEED to read this. Adding it to the TBR now! I'm going to agree with Kelly above - the cover definitely would not have peaked my interest if I hadn't read this review. 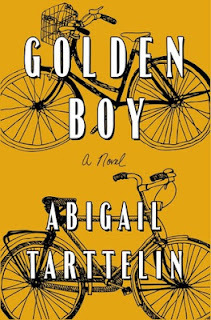 But judging by your thoughts, I have to say Golden Boy sounds like a fantastic book. I really should check it out one day. Great review! You really should, it's fantastic! I have to say that I looove the cover, lol. This sounds engaging! I need to check it out.